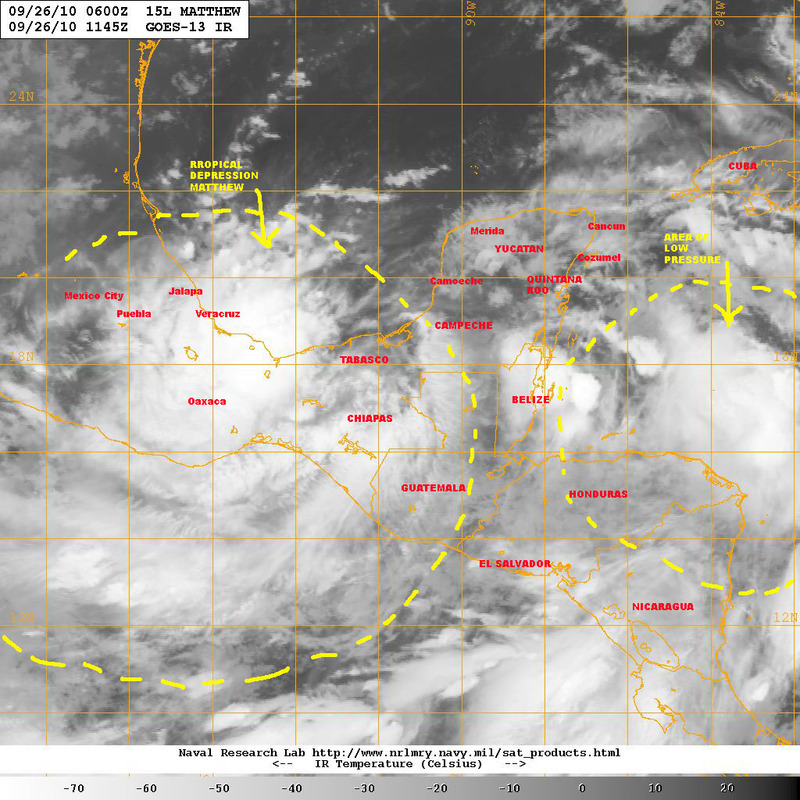 Visible light satellite view of tropical depression MATTHEW in the morning hours on 26 September 2010, while the storm moved over the western region of the state of Chiapas in Mexico. Matthew is generating copious rain affecting areas near veracruz, Jalaoa and central Mexico, which just a few days ago were impated by hurricane KARL. Early this morning of Sunday 26 Seeptember 2010 tropical depression MATTHEW was over western Chiapas in Mexico, generating heavy rains over a large area of central and souther Mexico, and affecting areas of central and eastern Mexico that were recently hit hard by hurricane KARL. Ever since making landfall as a tropical storm to the south of Cape Gracias a Dios in northeastern Nicaragua, near the border with Honduras, tropical cyclone Matthew has been difficult to predict as its track kept shifting in response to atmospheric components and the influence of topographic factors in Honduras, Belize, Guatemala and southern Mexico; as a result Matthew’s projected track was modified several times in the past 24 – 36 hours. The question now is: Matthew, what’s next? Projected track for tropical depression MATTHEW on 26 september 2010 developed by the Navy Research Laboratory, based on data from NOAA's National Hurricane Center. From previous postings on this site, we’ve seen how Matthew was generated by a very large tropical wave that at one point covered more than one million square miles of the Caribbean and Atlantic as it straddled the Lesser Antilles. As Matthew emerged as a tropical depression, growing into a tropical storm, moving toward the central American land mass, large cells of disturbed weather that had been part of the original tropical wave move ahead or remained to the east over the Caribbean. During its progress over land Matthew was drawing mositure from far away over the eastern Pacific feeding itself as well as the disturbed weather to the east over the Caribbean. Color enhanced infrared GOES satellite view on 26 September 2010 at 0745 EST showing tropical depression MATTHEW over southern Mexico, and the region of low pressure ('Matthew the Clone') in the northwestern Caribbean, which may move toward the Gulf and South Florida in the next 3 -4 days. Satellite imagery yesterday started to show how as Matthew kept moving westward the growing cell of disturbed weather that remained over the Caribbean has been drifting toward an area of low pressure between Cuba and the Yucatan peninsula. Analysis on future weather forecast shows this area of disturbed weather will congeal around the area of low pressure and move in the general direction of the eastern Gulf of Mexico and Florida. It is as if Matthew has cloned itself, or gone through a process of mitosis, and now we have a weather system moving toward Florida that may at the very least create a threat of rain, high winds, thunderstorms, and choppy seas for the Florida keys and south Florida by mid-week next week. The attached image shows advanced weather forecasts through 2 October 2010 showing the projected movement of Matthew the Clone. 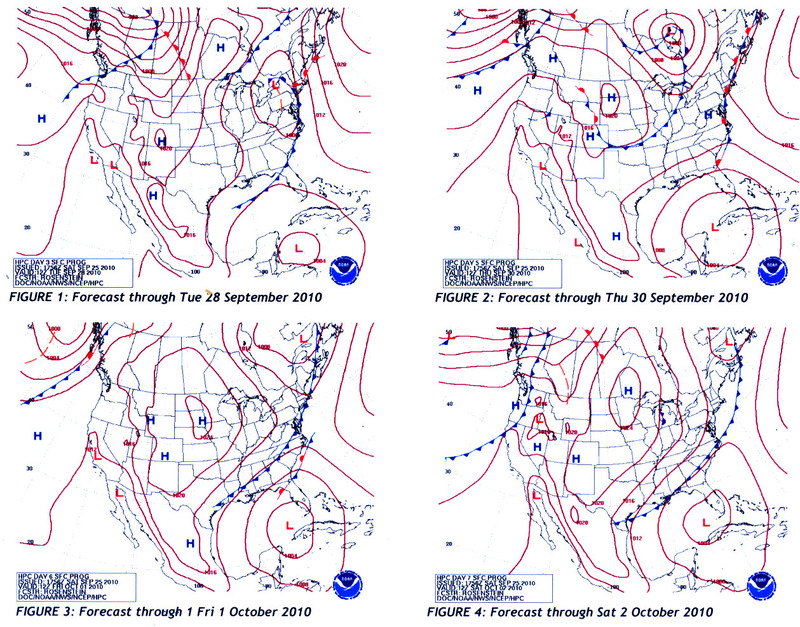 Advanced weather forecast for North America showing the progress of "Matthew the Clone" through 2 October 2010. 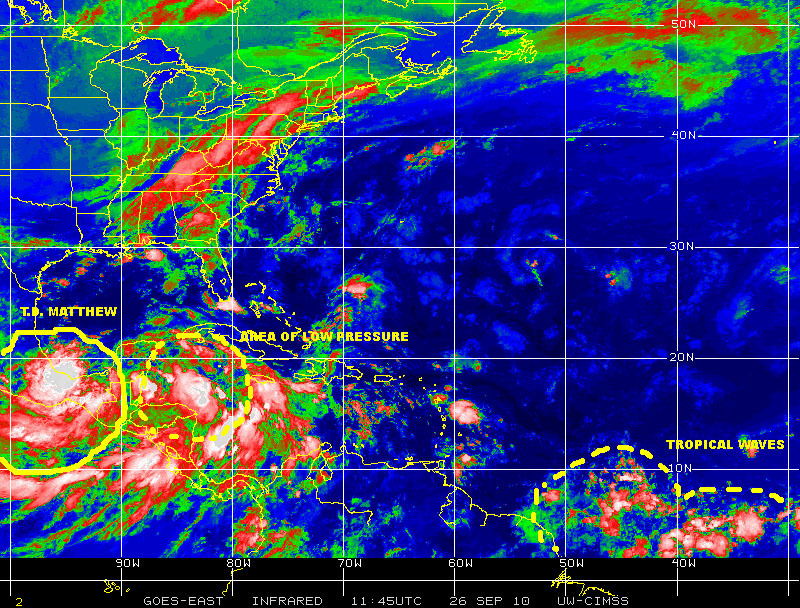 While this is happening ‘Hurricane Alley’ is populated by a conglomerate of rain and storm cells, not too dissimilar to the tropical wave that spawned Matthew, which will need to be monitored for any signs of potential development during the historical peak of the Atlantic hurricane season. All interests in the larger Caribbean, Gulf and Atlantic basin must remain vigilant monitoring these weather disturbances from the eastern Atlantic to the Gulf; given what we are witnessing with this cloning of Matthew and conscious of the challenging uncertainties inherent in tropical cyclone forecasting science, it is clear all vulnerable communities must do their part to pay attention, to remain aware, and above all to keep practicing Mitigation! !